This spheroid has another basis structure as the previously published Goldberg polyhedra, that were based on dodecahedron and icosahedron. This one is based on the cube (hexaeder) and octahedron - so interpret it as a transformation/combination of these two, with convex surfaces, to become finally a sphere. 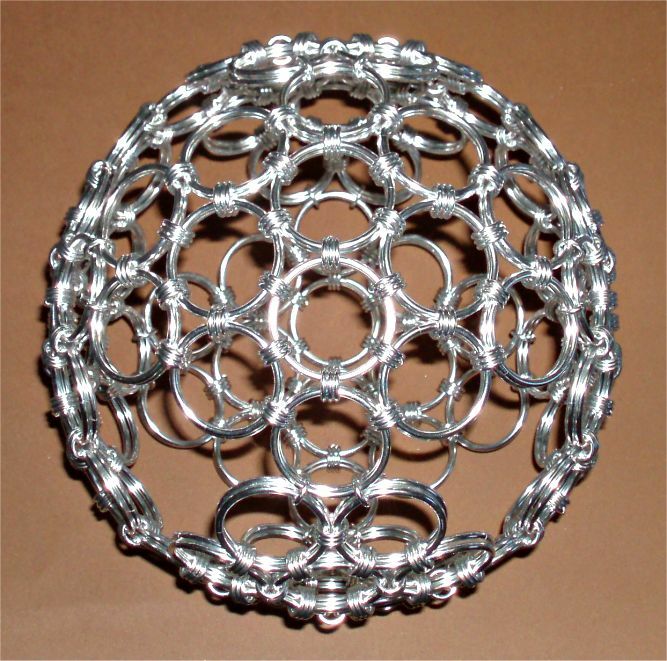 Inspired by a puzzle ball found as toy in a 'Kinder Egg', I built the basis structure from six diamond shaped surfaces, using two ring types as face rings, to reach already a convex surface shape, plus fitting connector rings - of course. After the basis shape is woven together, the eight yet open corners of that 'inflated cube' are filled with triangles woven from a third face ring type, plus the same connectors as used previously, and are basically the octahedron, that 'shines through' the cube. 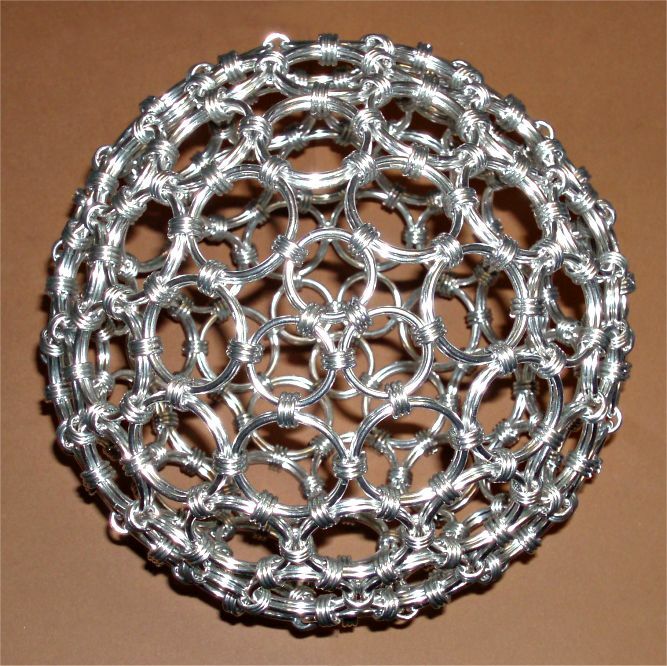 This all makes in total 108 ring pairs in three sizes, that build the outer surface of the sphere, plus the connectors. I won't publish the sizes publicly, but receivers of ring kits supplied by me or a reseller will find the sizes and ring amounts printed on the ring bag labels. Let's begin - with the six diamond shaped base surfaces. These are built from their center, using the largest rings. These are ring type 'A'. As this ball type can be built with more than three quarters of the connector rings preclosed, this is a good moment to preclose at least half, better directly near three quarters of the supplied connector 'D' rings, as then the weaving of the sphere goes much smoother. As the tutorial uses ball size 'extra large' for the photos, and this ball type is woven with tripled connector rings everywhere, I tell the needed numbers for these, and note the numbers for S and XS balls in brackets. Now the 'cores' first - do this six times, to make the basis faces. 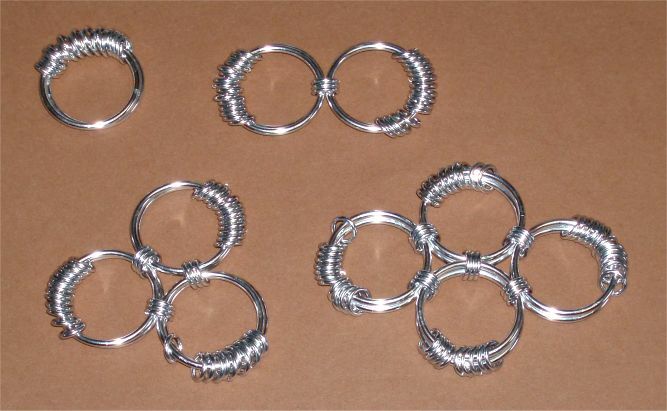 Take one large (A) ring, and add 18 (12) of the preclosed connector (D) rings to it - then double the large ring up. Go through 3 (2) of the connectors with a further A ring, add 15 (10) new connectors to it, and finally double up the A ring. 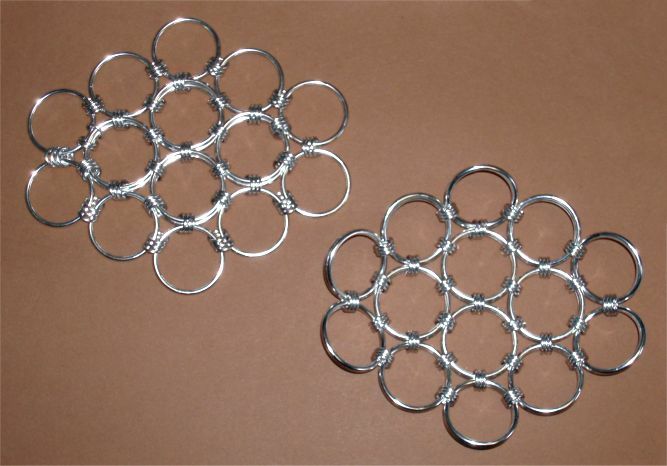 Go through 3 (2) each of the two large ring pairs' connectors, and add 12 (8) fresh connectors - thereafter double up the A ring, as previously. Repeat that, to turn the triangle into the finished core diamond. It has proven to be easiest, to surround the core with single face rings first, to avoid losing track, and then to double them up. This is shown in the photo. So begin at a random point (chose what is convenient for you), go with a 'B' ring through 3 (2) connector rings of the core, and add 6 (4) fresh connectors. Repeating that, go around the complete core; at the last position no added connector rings are needed, of course. Last, but not least, double the B rings up. You'll note that when doing the latter, the truncated-tip diamonds dish already up into a convex shape, that goes conform with the surface of the sphere part it will turn into. After you have finished the six truncated diamonds, it's time to sew them up. You'll surely be astonished, how fast this will go. Promised. Arrange two of them, truncated tip to long edge corner of the neighbor, and weave together, the first time using non-preclosed connectors. Repeat this, until you have a strip of four alternating-direction diamonds. Finally join the ends of the strip to a ring - the photo shows this seen from top and sideways. Using the same long edge corner to truncated-tip weaving method as before, join the remaining two diamonds to top and bottom of the ring. This will finish construction of the 'inflated cube' basis sphere. The body is already halfways rigid by now. You may call it a day, and declare the sphere finished. But there is more to do, if you want a really rigid sphere. So let's break out the 'C' rings, and build eight triangular corner fillets from these, and further preclosed D connectors. The photo shows this process, and I surely don't need to explain, by now. Last, but not least, mount these triangles into the corner holes, as shown in the final photo. It's properly done, if the transition edge will show rectangular 'holes' all-around. There were another possibility to set corner fillets, with alternating pentagonal and triangular edge holes - but this would need to use slightly smaller 'C' rings, that are currently not supplied, as I simply didn't calculate their needed size, yet. This may happen some when. As usual, a last note: HAVE FUN!